Jennifer Brooks, Brooke Haughey, and the rest of the marketing and business development team at Hogan Lovells are clearly working overtime on behalf of the firm’s lawyers. Their goal: to help Hogan Lovells’ lawyers better serve their clients and build their practices. What is (or should be) keeping your clients up at night? What are the boiling frog factors (emerging changes in the external environment) which your clients may not have noticed? What are the significant issues that threaten your client’s future? I am sure this isn’t the first time you have heard these questions suggested, but how often do you actually go through the exercise of pondering and answering them? As a commercial real estate advisor, this is how I would answer these questions for my law firm clients. 1. What is (or should be) keeping law firms up at night? The legal industry’s growth has been flat and industry reports indicate it is likely to remain flat — or even decline. Notwithstanding this trend, individual lawyers still hope and expect to make more money each year. To do this, firm revenues have to increase or expenses have to decrease. In the real estate industry, we help law firms decrease expenses by reducing occupancy costs. This goal is achieved by eliminating excess space, designing more efficient space and/or moving to lower cost buildings. Law firms (and the lawyers who own and work for them) are also very careful about capital expenditures. Law firm moves and new office construction are paid for in one of two ways: capital contributions from the firm (i.e. its partnership) or loans. Right now, many firms are focused on investing capital in technology and business staff – areas where the perceived return on investment is high. This focus leaves firms reluctant to re-allocate that capital to new construction. Similarly, debt service can be costly. My job as a broker is to help law firms understand the different pathways to achieving lower occupancy costs. They can restack their existing space to make their existing footprint more efficient and conducive to collaboration. This can be less capital intensive than a relocation. In the alternative, they can relocate and commit to a long-term lease that allows a landlord more time over which to amortize a higher tenant improvement allowance. Or, they can move to space already built out for a similar use and make limited modifications to the space to adapt it to the firm’s occupancy needs while limiting capital costs. That said, expenses cannot be endlessly cut. Eventually, focus must move to the revenue side of the equation. 2. What are the boiling frog factors (the water temp rises so slowly the frogs don’t know they are boiling) which law firms may not have noticed? If you pay attention to the legal industry, you hear about firms hiring laterals from other firms in an attempt to grow revenue through accretion. Granted, much of this lateral hiring is strategic in that the lateral brings an expertise or geographic coverage to the firm that the firm’s clients are requesting. However, hiring laterals just to tack on revenue can be short-sighted. Per Peer Monitor, hours worked per lawyer have decreased significantly from an average of 140 hours per month pre-Recession to 120 hours per month presently. This is a boiling frog topic and I applaud the firms that quickly realized it and began to focus on generating more work for the attorneys they already employ from the clients they already have so that hours worked per attorney increase across their firms. This increase in utilization results in revenues increases without attorney headcount increases. To achieve this result, compensation systems can be devised to incentivize the attorneys who control an abundance of work to share the wealth; however, as a real estate advisor, I focus on potential solutions offered through real estate. To that end, open and fluid working environments encourage greater interaction as well as random collisions between attorneys and staff. This often results in more conversations about specific client issues which in turn can prompt attorneys to offer assistance to their colleagues on accounts with which they were not previously involved. Open and fluid environments also encourage interaction between associates and partners which can increase awareness of other attorneys’ capabilities (and availability), thereby encouraging future working relationships. How are open and fluid environments built? Glass walls, attractive common areas, vibrant informal meeting areas. The options are abundant and existing space can sometimes be modified to foster these environments. 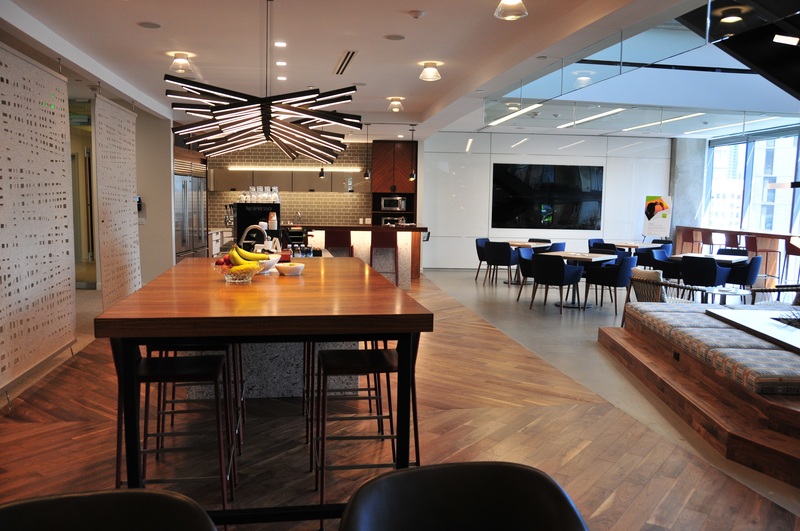 Hogan Lovells built an exceptionally open and collaborative environment in their Denver office and you can see more pictures of it here. 3. What are the significant issues that threaten a law firm’s future? Many clients are taking more work in-house because outside counsel does not provide what general counsel at these companies perceive to be sufficient value for the cost. One of the most-cited issues by general counsel is that outside counsel does not understand their clients’ business issues and instead focuses only on the associated legal issues. How can real estate play a role in improving this perception? Build space that invites clients in. If your firm has locations across the country and those locations contain vacant private offices, let your clients know that they are welcome to use those offices when they are traveling to other cities. Build inviting event space and then invite your clients to it to meet each other. One thing in-house counsel can’t get in-house is an introduction to someone outside of the house. Think about how you can connect your clients to each other in ways that are mutually beneficial to their businesses and then orchestrate those connections in your office. Build training rooms into your space and use them to educate your firm’s lawyers on business. Chicago-based Levenfeld Pearlstein educated its own people on lean practices for law and then offered a one-day White Belt workshop for its clients (taught by Legal Lean Sigma) in LP’s offices. You might also consider creating space that can adapt to your firm’s changing business structure. 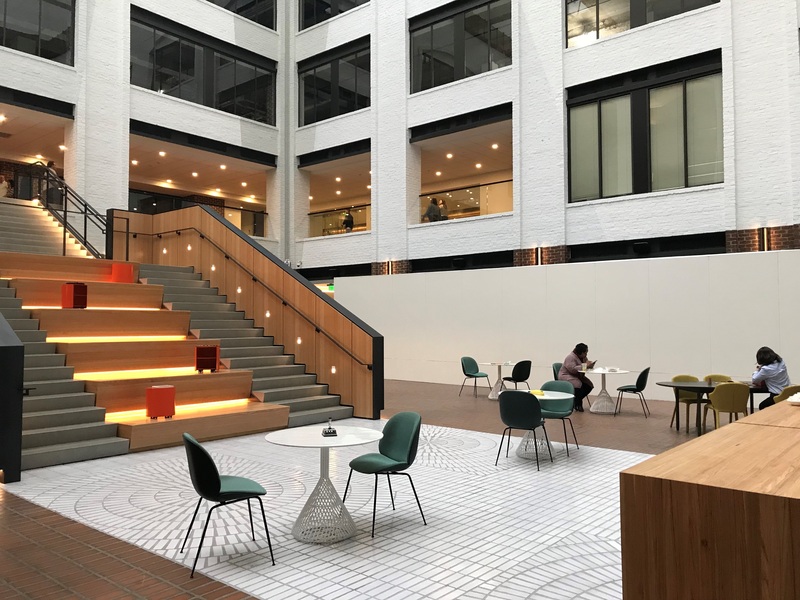 For example, build space for summer associates that can also serve as hoteling space for retired partners or incubator space where the firm can partner with clients and legal tech companies to innovate. Finally, ask whether your office is in a location that is conducive to your attorneys running out to visit clients and your clients stopping in to visit their attorneys. It should be both. Answer these three questions and your clients will love you. No question. [i] 2018 Report on the State of the Legal Market, Thomson Reuters and Bruce MacEwen, “But What Do the Am Law Numbers Really Show?” Thomson Reuters Forum, vol. 3, ed. 2 (2017), at 36, 37. [ii] HBR Consulting, 2017 HBR Law Department Survey, Nov. 14, 2017, at 49.